Atlantic Water Products Delaware Division, Inc. Comment: buying a house, & need to know how much will it cost . is a single family house. Comment: Existing water softening system needs servicing including filter/membrane changing. Possible installation of reverse osmosis system. 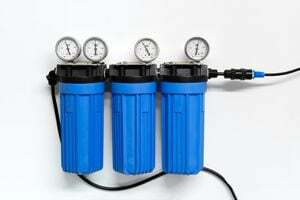 Comment: I would like and estimate on getting a water softener installed at my home. This is a brand new installation. Comment: I have a Noritz tankless water heater. I would like to install a water treatment system that will prevent scale buildup in the heater. I would like a recommendation and quote on a system would work best for my needs. My home has 1.5 baths. Comment: Customer prefers to discuss the details of the request with a professional. Comment: I have extremely hard water and I am looking to install a water softener system from the hot main source (near the hot water heater, etc.) In addition I would like a faucet/ spicket added BEFORE the softener because I use the hard water supply for my large fish tank. I am prepared to hire a contractor immediately upon negotiating the best rate. Pompton Lakes Water Treatment Companies are rated 4.77 out of 5 based on 588 reviews of 11 pros. Not Looking for Water Treatment System Contractors in Pompton Lakes, NJ?